It's just one of the workplace gender insights in a new study. There are certainly measures by which we've barely made any progress on gender equality in the workplace. There remains a "pink tax" that has women still making 81.8 percent of what mean earn for the same work performed by men. And there's still a shocking underrepresentation of women in executive suites. Hive is a productivity platform that works with an impressive roster of large companies, and they wanted to learn more about if and how gender experiences have changed in today's office spaces. The company was able to anonymously source information from over 3,000 working men and women, and they've just released the results of their analysis in their "State of the Workplace Report" on gender. It contains some interesting insights. All of the infographics in this article are by Hive. Who produces more, men or women? According to Hive, women work 10 percent harder than men in today's offices. This conclusion is the product of two other statistics. First, both men and women actually complete about 66 percent of their assigned work. However, women are assigned 10 percent more work than men these days — that they achieve the same completion rate tells us that they're being more industrious. Why are women being given more to do? 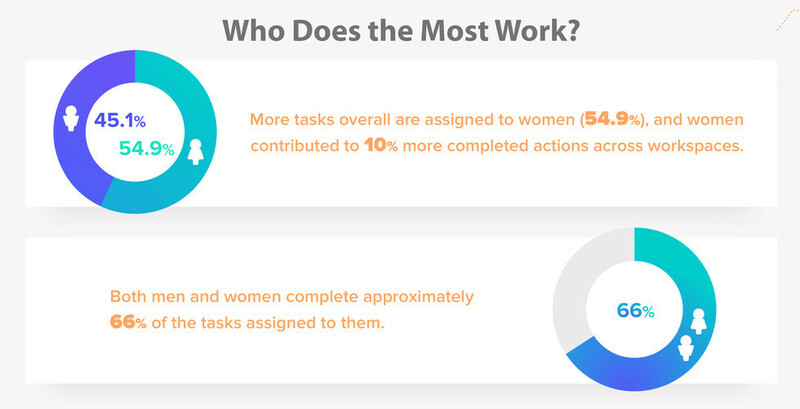 Hive cites research that finds it has to do with the kind of work allotted them, noting that, "women are assigned and spend more time on non-promotable tasks than men [our emphasis]. These non-promotable tasks are any activity that is beneficial to the organization, but does not contribute to career advancement." So basically, things men don't want to do are begin handed to women. Does chatting really get in the way of work? Research by the University of California suggests that chatting significantly disrupts the workday since it takes, on average, about 25 minutes to get back in the groove after such an interruption. Another study found that chatting leads to a reduction in productivity of about 20 percent. Overall, women chat 20 percent more than men, but — given that they get 10 percent more done — chatting doesn't seem to be an issue for their productivity. In addition, they only dominate person-to-person chatting. Group chats — such as those conducted on platforms such as Slack — are often less welcoming to female employees, and Hive finds that men do actually participate in them a bit more than women do. How can we close the gender equality gap in politics? Is the use of passive language still a gender issue? There's a generally accepted narrative that women aren't being assertive enough at work in the word choices they use for communicating. Hive cites the Just Not Sorry Gmail plug-in that flags such shy language. However, Hive's research finds no evidence for this particular gender gap, showing that passive language is equally likely to be used by both women and men. Are genders finally becoming integrated? This one is a bit disheartening, and may speak to the inter-gender tensions — or at least lack of comfort — that afflicts our cultures as a result of past and continuing gender inequality. 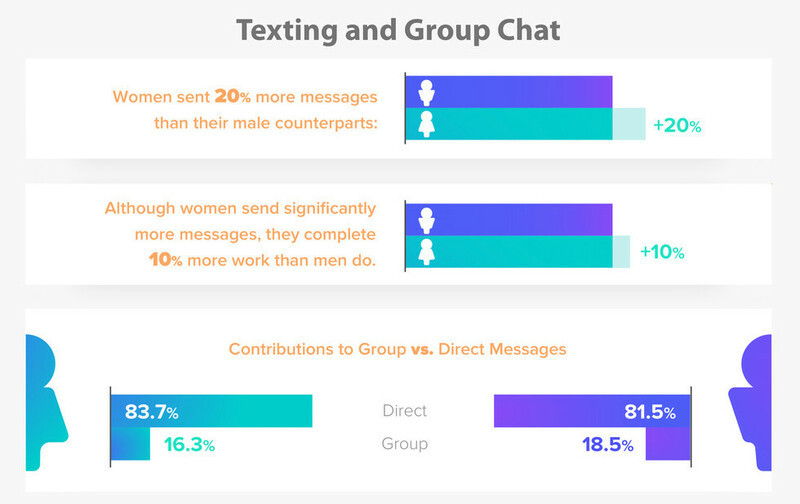 When it comes to individual chats, we tend to text others of our own gender. And when it comes to handing off work to others, the same is true. This certainly helps perpetuate the habit of keeping women occupied with non-career-advancing work. For some it's probably the result of continuing workplace tensions, but for others it may be just a well-ingrained habit: as if stuck at some never-ending high-school dance, we may be simply more comfortable among our own. 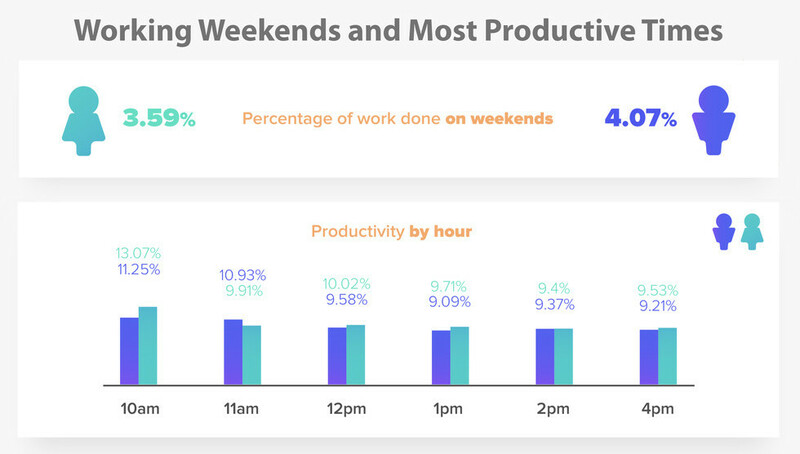 Do you get more done if you work on weekends? There are definitely more productive times of day during the work week, though. At 10 a.m. you're, relatively speaking, a house afire, by 4 pm, it's all ashes and cinders. Hive's report provides a glimpse of how we work these days, and how much further we have yet to go when it comes to truly integrating men and women at work. High school has been over a long time for most of us. It's past time to grow up.